2075. The circular range of plant-houses, figs. 607, 608., was designed for the botanic garden at Birmingham; and this form was adopted because the houses were to be approached by the public from the north. The section (fig. 607. ), which is taken across an imaginary line in fig. 608. from i, through g and k, to a, exhibits the following details: ï¿½ l l, Exterior pits. m m, Interior pits. n, Tunnel. o, Archway, forming the entrance to the inclined plane which leads from the tunnel to the surface of the central area. p p, Two steam or hot-water apparatus; either of these will supply heat to the whole range; but two are recommended, in case of accident. q, Potting-shed. r, Cistern. s s, Walks within the hothouses. t, Walk over them, in which, during winter, rolls of matting may be kept, for letting down over the glass to exclude the frost. u u u u, Situation of pipes pierced with numerous small holes, for watering all the hothouses, in imitation of a shower of rain, as at Messrs, Loddiges's. v, Steam pipes shown under the pathways. w w w w, Benches for pots. x x, surface of the terrace walk. y z, Elevation, taken opposite the centre of either of the four entrances. a a a a, The main entrance from the surrounding terrace. b b b b, Corresponding entrance from the interior area. c c c c, &c., Shelves for plants in pots. e e e e, The exterior pit, in four divisions. f f f f, The interior pit, in four divisions. g, Central tower, in which is contained the steam or hot-water apparatus in the cellar story, a potting shed on the ground floor, and in the upper part a supply cistern for the hothouses and jets. 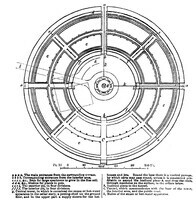 Round the base there is a vaulted passage, by which carts may pass round, unless it is considered preferable to ascend the inclined plane A, and drop the court, through manholes on the surface, to the cellar below. h, Inclined plane to the tunnel. i, Tunnel, which communicates with the base of the tower, the interior area, and the public road. k, Mains of the steam or hot-water apparatus.